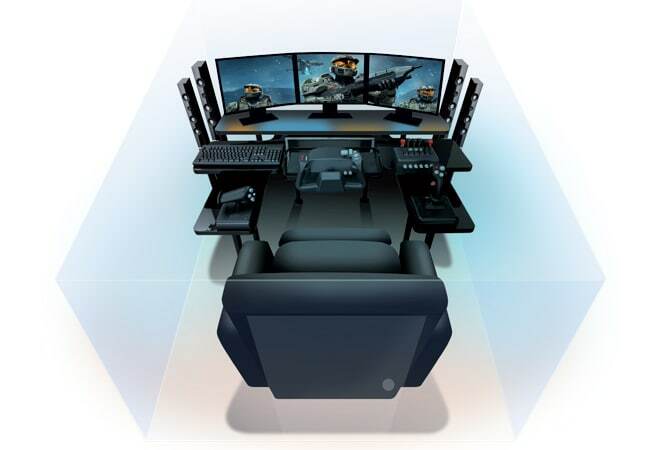 If you are passionate about gaming, get yourself some space and set up a dedicated gaming room. If you are passionate about gaming, get yourself some space and set up a dedicated gaming room. This should be a combination of comfort and technological assortments - from the latest consoles to the cool, relaxing couch. But other than these two, there are a lot many things that should be on your mind. Here, have a read. The first and foremost thing to keep in mind while setting up a gaming room is its size. There isn't any rule about the dimensions of such a room but there are a few things you should keep in mind. The room should neither be too big nor too small. It should have enough space for the TV to be placed in a noise-free area. There should be adequate distance between the gaming console and the recliner or the couch you plan to install, where you will sit and engage yourself. There should be some extra space too in the room for your friends and siblings to sit around. If the room is too big, there will be a lot of empty space. On the other hand, if the room is too small, you will have a lot of distractions while gaming. An integral part of gaming is the sound of the game. So if you don't have good speakers to channelise the sound, the whole experience can be spoiled. There are multiple speaker systems available - 2.1 channel, 5.1 channel, 7.1 channel and even 9.1 channel. Newage speakers also offer wireless connectivity, eliminating the mess of running wires across the room. La-Z-boy or a recliner or a bean bag is a must have in a gaming room where you can sit continuously for hours, without getting tired. Or even take a quick nap without stressing your body much. In gaming rooms, sound levels are often high. But this should not trouble other house members or neighbours. So, soundproofing the gaming room should be your top priority. Soundproofing also helps in improving the sound quality inside the room. You can either go for a contractor who can sound proof the room or do some basic bit yourself that can absorb noise. Some popular methods used are adding framing to ceiling and walls, and using layers of insulating foam or drywalls designed specifically for noise control in buildings. Carpets, thick curtains and free-standing or wallmounted acoustic panels also absorb noise. Gaming on a small screen isn't as much fun as on a bigger display. Here you can choose between having a projector or a sleek LED TV. With a projector, you can change the distance and projection size later. However, with a TV, you will be stuck with the same display size. However, do make sure that whatever you may choose, a TV or a projector, both have enough connectivity options for pairing it with speakers, consoles, etc. Setting up a gaming room means having a lot of gadgets and wires running across the room that can make it look messed up. It the wires are left loose, they can pose danger as someone might fall. Cover all the wires under carpet, behind the shelves or tie them so that they do not spoil the look of the room. Instead of running wires across the room for the power socket, get a good looking, high-quality extension cord. If you are into gaming, you would have your own, personal favourite console - Microsoft Xbox, Sony PS or Nintendo Wii. What you also need to think about is whether you only want controllerbased gaming experience or even gesture-based. Accordingly, you will have to invest in extra controllers, camera, etc. as only a single controller is bundled into the pack. It may sound boring but lighting of the gaming room is also crucial. The gaming room should not be overly well-lit but the lighting should be such that the room is functional as well as stylish. One should have lighting at different places or specific areas of the room, as per the need. Do keep in mind, if you are going for a projector setting, the room should get completely dark for the best output. For a TV setup, a light should not be placed on the wall opposite to the TV. Prefer remote control lighting for more fun. Chances are that you would have a wireless router at home for Internet connectivity. But for online gamers, there should be a dedicated wireless network that should not be interfered with speed issues. Get yourself a gaming router to connect your console.